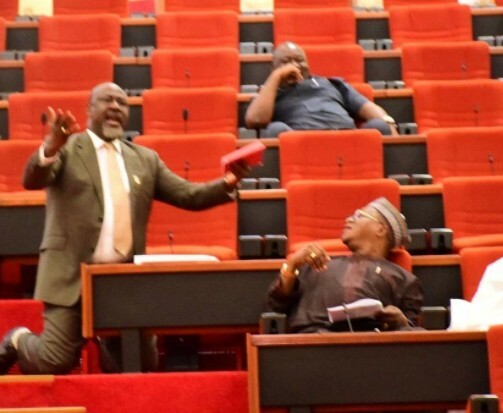 Senator Dino Melaye who represents Kogi West Senatorial district yesterday went on his knees to beg his colleagues to save the people of Kogi state as they are currently in perilous times. He told his colleagues that civil servants in the state are being owed many months salaries. He made reference to the director in the state civil service, Edward Soje, who was owed 11 months salary and recently committed suicide after his wife of 17 years welcomed a set of male triplets. Dino also made reference to the viral video of an elder couple weeping over the loss of their child who required medical attention that they could not afford because the man is being owed many months salary. Dino called for an intervention from President Buhari and his colleagues.